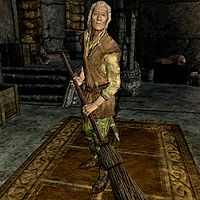 Donnel is an elderly witchblade who lives and works at The Treasury House in Markarth. He and Nana Ildene clean the house. They both show their true selves during the related quest. Donnel can always be found sweeping the floor at the foot of the northeastern set of stairs, and when spoken to he will only say: "I work for the Silver-Bloods. Help clean." or "Just here to work." He never sleeps or eats, and will only leave his spot and reveal his true intentions after you have questioned Thonar. He wears a set of farm clothes and a pair of boots, and is equipped with a steel dagger. He carries a key to the Treasury House and a selection of lower-class loot and gold. To aid him in combat, Donnel knows the spells Oakflesh, Raise Zombie, and Flames. Donnel's death can be avoided by pickpocketing and reading Thonar's or Nepos's journals instead of questioning them, then heading directly to Eltrys. This page was last modified on 19 October 2015, at 00:40.